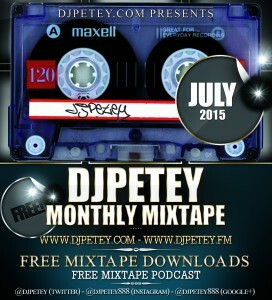 July 2015 MixTape – Mixed by DJPetey – Now Streaming | DJPetey.com!!! This month’s mix is a BEAST! Its been 2 months of themed mixes so this month is ALL NEW MUSIC and there is a ton of it! You know the drill by now. If you are a podcast subscriber, the mix should already be in your itunes. For the rest of you, can you listen to and/or download this bad boy right now at the new and very improved www.djpetey.fm. (If you havent checked out the new site, you really should. We now have 19 of my mixes up there for your streaming pleasure.) Anyway, to make it very simple, click HERE for the new July Mix! If you wanna check out the track listing, click “read more” below. Cool? Hope you are all having a great summer! Enjoy the mix! Welcome to July!